“Thrash” is the follow-up to ROAST IN PEACE, the highly celebrated original Dark Roast Blend, small-batch roasted from 100% Brazilian Arabica, with distinctive notes of “Chocolate, Dark Caramel, and Roasted Nuts”, already receiving high praise from coffee lovers and media alike. With features on major web outlets like Blabbermouth, Brave Words, a segment with Ellefson on Anthrax drummer Charlie Benante’s Coffee podcast, and a feature in the July issue of REVOLVER MAGAZINE, and high profile artists like Hellyeah, Sevendust and Lamb of God publicly singing its praises, Roast In Peace has already become a staple in the mugs of the Rock N’ Roll elite. 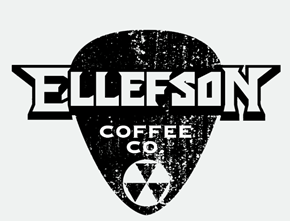 Ellefson Coffee Co blends are artfully small batch roasted by Parliament Coffee Roasters, and the blends handpicked by Ellefson himself. 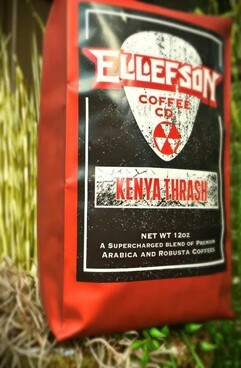 Both blends are available in 12 OZ Whole Bean (or Ground) bags directly from empmerch.com.